Orca Place - Ram Mechanical Ltd. Orca Place - Ram Mechanical Ltd.
Orca Place is a residential, strata high rise building in the heart of downtown Vancouver, consisting of 160 suites on 30 levels. The existing domestic hot water production system was comprised of three gas-fired domestic hot water tanks, which were consuming a lot of fuel and were expensive to maintain. At the time of their removal, all three tanks were leaking. 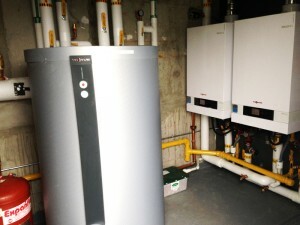 Ram Mechanical Ltd. proposed installing two Viessmann boilers along with two dual coil Vitocell indirect storage tanks. Many people are unaware of this style of system for domestic hot water production. The tanks last much longer and provide better value. The installation proceeded as proposed and the Strata is very pleased with the results.